Our local team at Just shutters are experts in Swanage Plantation Shutters. The team strive to provide the most beautiful bespoke shutters with exceptional service. Therefore, for shutters in Swanage look no further than Just Shutters! Call your local Swanage Plantation Shutters experts today to arrange a home design visit on 01202 240769. Plantation Shutters are a one of a kind product which are made to last! Therefore we offer a lifetime guarantee. Shutters will provide added value for money year on year. 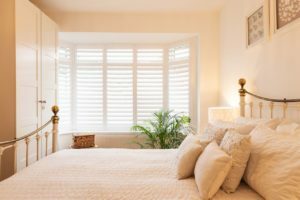 Compared with curtains and blinds (which may fade, gather dust, tangle or warp) shutters prove to be a practical solution! Therefore, shutters are fantastic value for money due to their longevity and low requirement of maintenance. Furthermore, shutters provide a sense of luxury and style to your home. As a result of this, it is not hard to see why so many people see shutters as a desirable accessory for their homes. For examples of our shutters , browse through our galleries here to get inspired. For more information or to book a free home visit, please don’t hesitate to call us on01202 240769. Furthermore you can request a brochure or get an online shutter quote estimate now. At Just Shutters, we take customer satisfaction seriously. Therefore, we are thrilled to have been awarded a 9.9/10 rating on Checkatrade. Furthermore, we have listed some of the 1700+ reviews below.